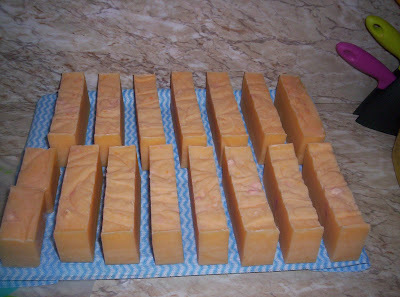 Here is the second installment of my mango scented soap. I made the soap 2 days ago and it has been sitting, encased in towels, on my dining table for 2 days now. I am having my parents over for a birthday dinner tonight though so I need my table. This was a great incentive as I also really needed to complete the next process in my soap making adventure. 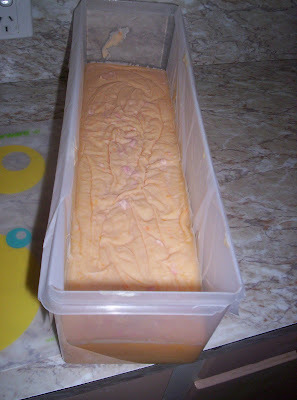 This is how the soap looks in the mould after it has cooled. It needs to sit in the mould for between 24 to 48 hours. Once it is dry, it will start to pull away from the side of the mould. It is important that the mould you use is flexible as, at this stage, you need to loosen it from the sides of the mould before inverting it to remove the soap. 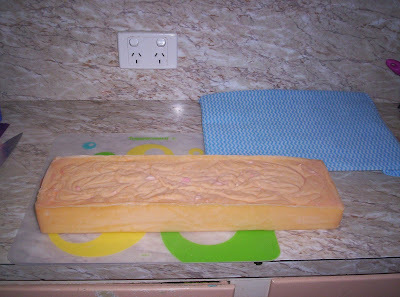 This photo shows the soap once it has come out of the mould. The greased proof paper is still sticking to the soap but will peel away easily. It is a similar process to peeling the greased proof paper from the bottom of a cake or slice. These are the materials I will use now. 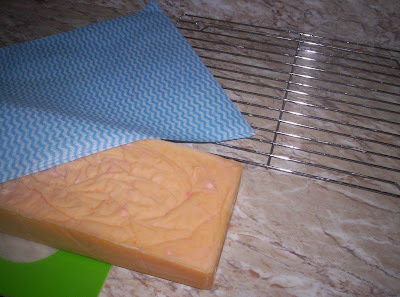 I dry my soap on a metal cake rack. It allows air to flow around the soap and leads to even drying. This shows how I prepare my drying rack. I buy the chux wipes on a roll and take 2 sheets and fold them over. I then cover the rack with the chux towels. I did not do this initially and, as the soap dried, marks appeared on the soap in lines. I think that these were places where the soap didn't dry as quickly. Once I started lining my cake racks, I stopped getting lines in my soap which affected the look of the soap. 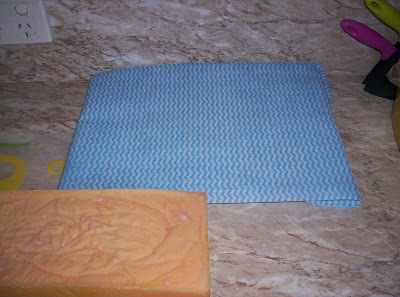 My soap has now had the greased proof paper removed, my drying tray is ready and it is now time to cut my soap. I love this part. My kitchen now smells like mango and the soap is so soft, smooth and silky to touch. This is showing the second cut in my soap. I am using a ruler this time so that I can ensure that my soap bars are all an inch wide. 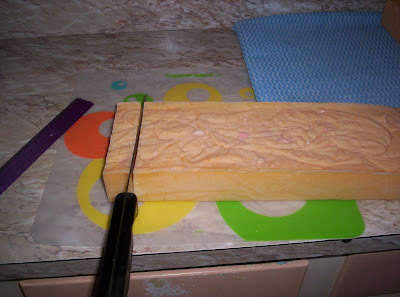 It is very easy to cut at this stage, just make sure that your knife is big enough to span the width of your soap. It makes for a much smoother cut. I also prefer to use a smooth bladed knife as I think a serrated edged knife would leave marks on the cut sides of the soap. My soap is now all cut. It will stay on this drying rack for the next 4-6 weeks before I put it into a container. I tend to turn my soap every day for the first week and then only once or twice a week after that. Final close up of a finished bar. I love having some waves and ripples on the top as I think it adds character. The colour is a light apricot but, every now and then, there are swirls and ripples in the colour. Every piece is different and unique. Hope these 2 posts have helped any potential soap makers. 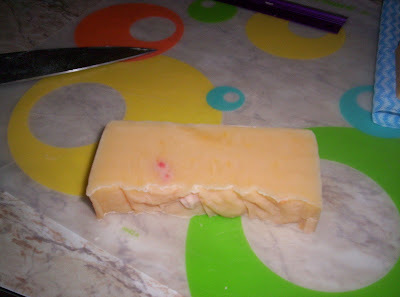 My next project with be a red soap with raspberry scent. The raspberry oil smells just like a redskin lolly so I can't wait. Oh yummy! 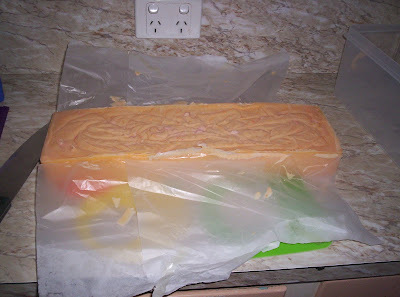 Raspberry soap sounds delicious, thanks for posting the processes involved, its very easy to follow, I can't wait. getting there, just need implements and fragrance! Once you have done it the first time Ezri, you will be surprised how easy it is. I do it automatically now. I am making the raspberry one today so my kitchen will smell lovely again!! Hi everyone. I am using this blog to keep track of my craft activities. I am a single Mum who is planning on a totally homemade year for presents. In order to achieve this, I will be investigating and trying a lot of new projects. I plan to discuss what is working and what isn't here so that I can have a record of my efforts. It will also be a way to ensure that my presents aren't doubled up if I choose to do the same thing next year. I love to knit, crochet and sew. I am also just getting into card making. I am also a recent convert to cold process soap making and, I must say, I am currently addicted to making all different soaps. I also plan to investigate felting later this year. Hope you enjoy reading this blog.